Used for 8 months, in fair condition. Top equipped with six open burners. Open burners with high output and optimum heat distribution, thanks to the special angle of incidence of the flame: 6 burners with double-crown burner cap rated at kW 6 Ø 110 mm. Optimal versatility with power reduction by minimum . Pressed burner surround in satin finished 18-10 stainless steel, integrated into the top, depth mm 74.5, with rounded corners, for efficient spill collection and easy cleaning. Distance between pan bottom on grid and base of burner surround 116 mm. Top burners and burner caps removable by hand for cleaning, protection over pilot light and thermocouple. Special Venturi tube inclined in order to avoid injector plugging. Height of grid over top optimised for adequate air supply to burners even with large pans and top fully occupied with burners at full output. Front/rear burner control signs moulded into control panel itself for inalterable, easy-to-read indications. Heat-resistant knobs with screen printed markings and reference index printed on control console. Predisposed for connection to other Gamma series elements. 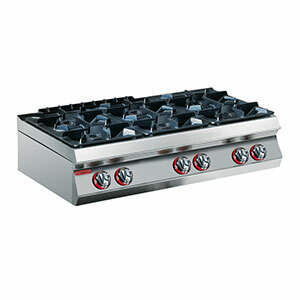 Open burners can be equipped with: fire-proof reduction disc allowing indirect cooking; ribbed or smooth radiant plates. Gas burners safety valve-controlled with thermocouple and pilot light. Pilot light housed in open burner and protected against accidental quenching by liquid spill. Top burners and burner caps constructed in RAAF enamelled cast iron. Pan grids 345x586 mm each (one grid each two open burners), constructed in RAAF enamelled black cast iron. Access to all parts through control panel, easily removable.